In light of Russia's recent incursion into the sovereign nation of Georgia, we thought we'd take a look at some of the fiercest non-tracked Russian military vehicles of all time. In square miles, Russia is the largest country in the world and includes every geographical variance imaginable from arid steppes, sprawling metropolises, the world's largest forest and a vicious tundra to the north. To defend such a diverse territory, their military has developed a diverse array of vehicles as extreme as the climate. 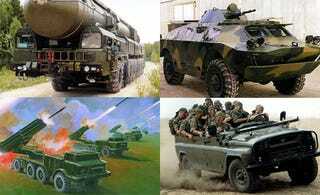 Below is our list of the ten fiercest non-tracked Russian military vehicles of all time.